August 25, 2010 December 8, 2013 Posted in Misc. My mother’s rock garden has taken many forms over the years. No doubt it began as a way for her to accommodate a semi-shaded space in the back yard where no grass would grow. She always loved rock gardens. When I was little I remember her industriously working with a difficult slope on the rocky edge of our small front yard. I suspect it made perfect sense to a woman who loved form, color, and natural settings. I didn’t spend much time dwelling on her latest rock garden when I visited her on summer vacations, because it was always there. In fact, she loved exploring the nearby river banks, and I suspect many of the smooth, polished rocks were finds brought home from those walks. There were also pitted and jagged lava rocks relocated from the volcanic flows further upcountry. Early on, I remember she thoughtfully planted an angular juniper bush to one end of the garden, which became part of its basic structure. 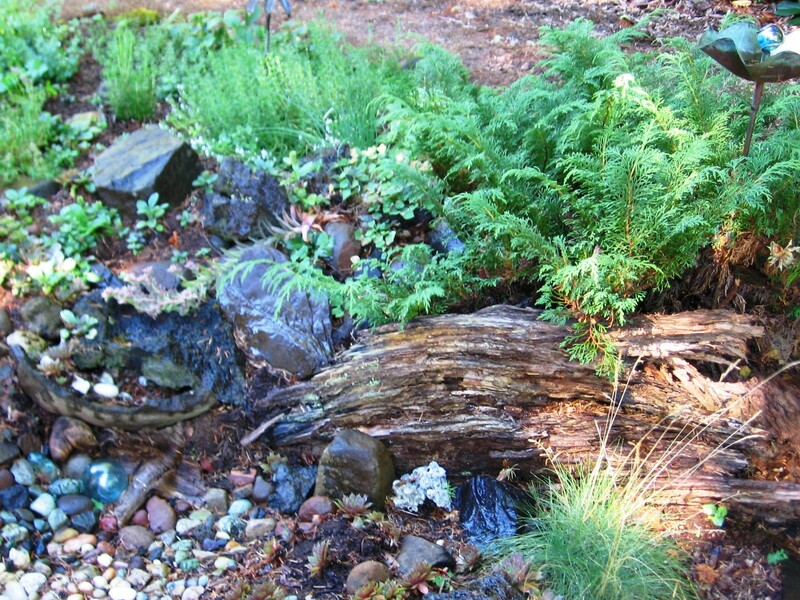 About the same time she also dragged home a weathered Douglas fir log, which she carefully positioned near the juniper for added focus and texture, and with these simple elements the garden gained a graceful kidney shape. The larger rocks spilled out from the elevated juniper and drew the eye at an angle along the odd shaped stones that tumbled and flowed downward. She loved her hens and chicks, and the succulents were abundant in her early garden; a wise choice because they require little watering and maintenance. Overnight they wantonly pop up among the rocks in surprising spots; mom called them her volunteers. On one of my trips home from Florida, where I was likely living on the water, I thought her garden needed a water feature. We spent much of that visit locating a tub suitable for a small pond, plus the circulation pump, electrical cords and all the other odds and ends to make it happen. We tore into her nicely defined rock garden, trading off while we dug an enormous hole deep enough to hold the tub. My mother never talked about this major disruption to her plan. The tub sat there for years, an odd appendage that made no sense. Perhaps she was hoping I would return someday and correct the awkward mess that only served to collect leaves and attract mosquitoes. Over the years the hens and chicks grew and multiplied and she tucked a few new plants into the rocks, but it didn’t change much after that. One year my brother took up the cause and presented her with two tall hand crafted copper flowers to add to the mix. On visits, we would stand out by the garden and move the copper flowers, as if they might multiply at will when placed in the right location. In the final months of her life I spent considerable time at her home. One of the tasks I finally took on was resurrecting her rock garden. I’d tinker there and add my own touches. 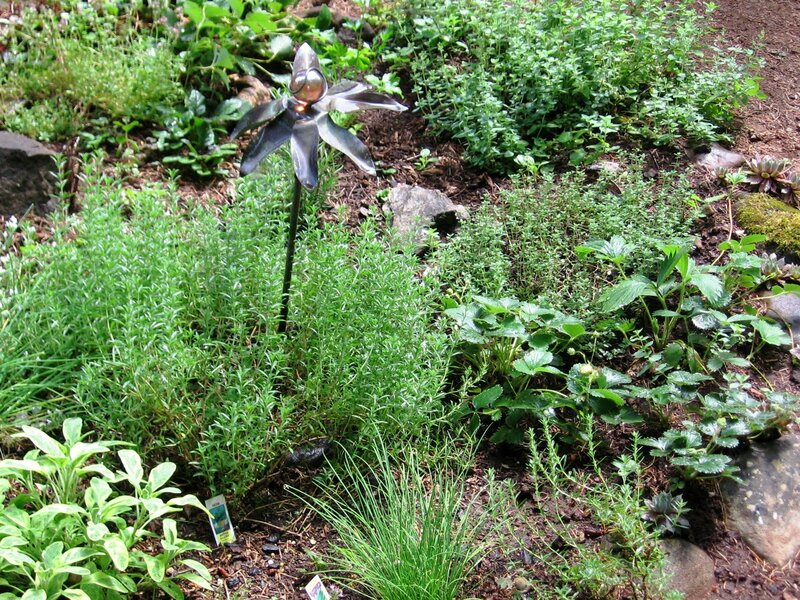 I planted herbs among the rocks: oregano, thyme, rosemary, and sage and to my amazement, they took hold and settled in. One day, when I could avoid it no longer, I tackled the removal of the bizarre brown tub. It was firmly embedded in its hole, but with unrelenting resolve, I finally yanked it out. I eyed the cavity left behind, and with waning strength I wandered about the yard and gathered up all the loose rocks I could find and filled it in. Amazingly, it formed a gentle dry river bed that looked as if it had come to an end, of its own volition. Over the top I scattered a collection of memorable stones she had set aside and never used. It was later that same summer, and we had scattered most of Mom’s ashes about her favorite haunts: along her beloved river, and at a private waterfall closed to where she was born. One night, when the moon was full, I took one last handful of her remaining ashes outside and sprinkled them over her rock garden, where I knew she would have finally approved. 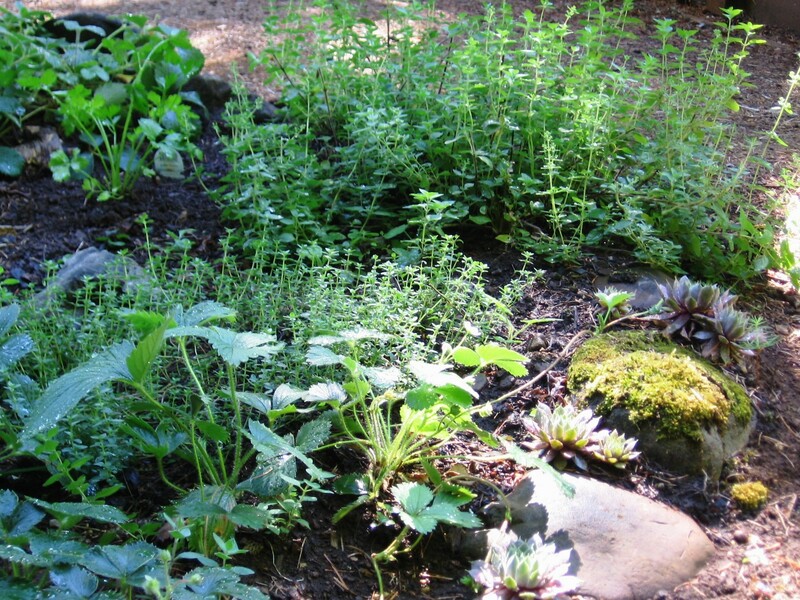 It’s no surprise that the herbs now flourish, and for me, the garden has become a mysterious attraction and a source of tremendous renewal. On any sunny day, if you were to look out onto the rock rimmed herb garden, you’d likely find butterflies and birds darting and dancing about the rocks and hovering over the lush beds of rosemary, sage, parsley and thyme.